I'm personally happy to share this a once-in-a-lifetime deck treatment. As a professional painter, I've learned to avoid bothering with decks. With this eco-green-chemical change to your wood, you'll have time for more important things! What does a professional painter want in deck protection? One and done baby. Wow, a no-maintenance deck treatment. I’m so happy that my paint store buddy recommended this to me—I had no idea of the existence of this type of one-time-only spray wood stain. You want this for your deck, Luke Skywalker. This is the droid you are looking for…the force is strong in this deck treatment. It’s more than stain—it’s not really a true ‘stain’, just better, Luke. Eco Wood Treatment, is a once-in-a-lifetime preservative: low effort, low cost, great protection. Really, there is no downside, except maybe that colors are limited. We are not paid in any way from any manufacturer to recommend any product on this site. This comes as a powder that you mix with water, then either spray or roll/brush. Below we discuss applying it. No-brainer: spray it. 5 gallons (a party-sized deck). I view this type of deck treatment as being like the factory green/brown “pressure treated” wood treatment. Amazing story in my short video at the bottom. 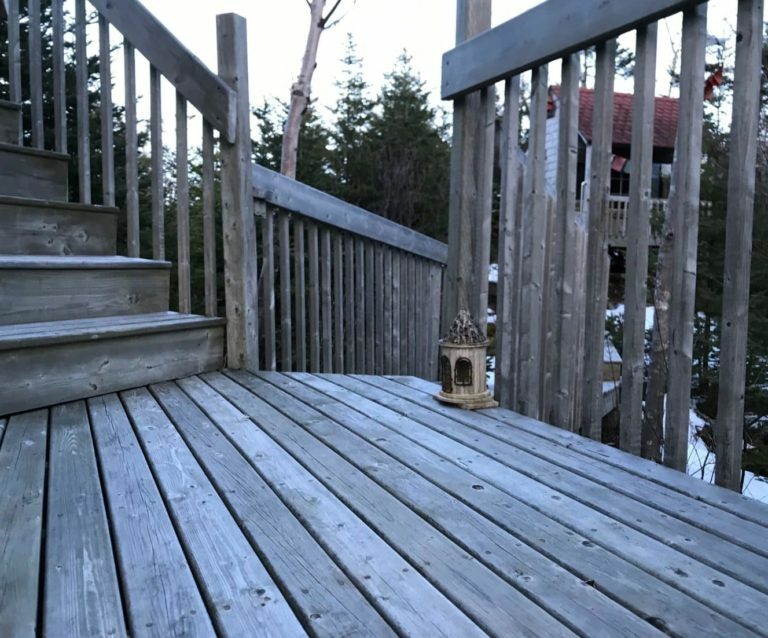 The photo shows my deck just after treatment (Silvery Patina color): we had a 20-year-old deck of the ‘green’ pressure treated wood that was totally faded but still tight. You can see where we had a knot fall out some years ago and how I replaced it with a plug of the green treated lumber. In the photo at the top, it has aged 2 years: looking good. 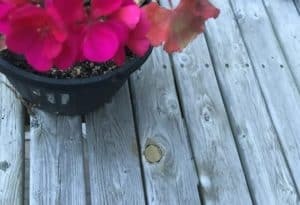 I’ll probably re-treat my deck every 5 years with the same product because I know what it means to replace a deck: this is so low-cost compared to replacing my deck! EcoWood Treatment has come out with several color versions since I did my deck. It’s based on the same powder that you mix with water, but it comes with a bottle of dye you mix with the solution. The colored version is not supposed to be used on surfaces you walk on, but it can be used on all other outdoor wood. Sort of a deal breaker for me. I used the non-color version: Silvery Patina , the one with no dye included (you see this product in their video). In my video (see below) you can see what it does to wood very clearly. Looking for Redwood Stain? I doubt the red is like the ever-popular redwood deck stain, but email them to find out: excellent response time. What convinced me to try it? 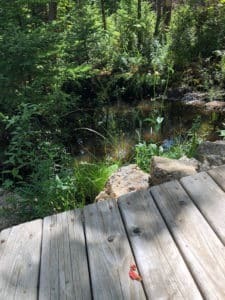 Parks Canda uses it on many outdoor structures and walkways, and other cities are doing the same. It means a lot. 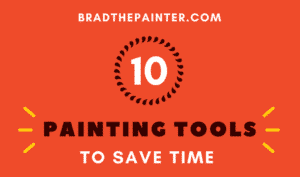 “Hi Brad, it does not come off..it stains the wood–rather than just coating it… The colors will slowly fade away after 5 or so years and may need to be reapplied.” So that sounded very honest to me. They seem to honestly say that the color may fade, but the protection is permanent. I applied it with this insecticide sprayer. Using this as a deck stain sprayer is the way to go since it can be kept at a low pressure (pump it less). Much more control. If you want a big-boy sprayer, the real Dr. McCoy, read our post about sprayers. Key tip with all sprayers; keep the tip wet when using and be very clean when storing. Submerge the tip in a can of water when taking a break and blow out air for a long time when totally done. Don’t let anything but clear water dry up in the tip and it will last for years. Mine has. You can spray wood stain or paint as well, of course, but the cleaning is a bit harder. Decking oil and other types of spray wood stain need re-application forever, what that wha? Again, we are never paid or compensated by any maker of any product we recommend, and we say that this is the very best deck finisher on the market. In the video from their site, the fellow makes only one claim that I found to be not-so-true. He says that the dried film on windows is easy to remove. Well, I let it dry without wiping and the film was very difficult to remove from glass. I had to scrape very hard with a wet rag and razor blade. Slow work. I should not have let it dry, duh. So have some clean rags ready. As with any deck stain or deck treatment you spray, protect with a hand masker that dispenses paper or a film of plastic along with painter's tape: I invented this key painter’s tool in 1977: I just cannot prove it !! Make sure it will work for you: It works with either brand new lumber or old lumber that has had the old paint etc., removed. 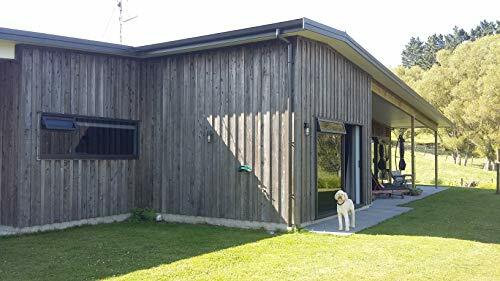 Another issue is pressure-treated lumber: Factory treatment may have affected the ability for this type of wood treatment to actually wet the wood surface. Test it: Before buying and applying the product, sprinkle water on the new pressure-treated wood as a test. If the water beads up, then there’s too much water repellency for Eco Wood Treatment (or any deck stain treatment) to work. Just wait until natural weathering occurs and the water does not bead up. How long does wood stain take to dry compared to this? This stuff absorbs and dries like a quick rain shower. Oil-based wood stain takes hours, but that’s expected. Can I brush it? 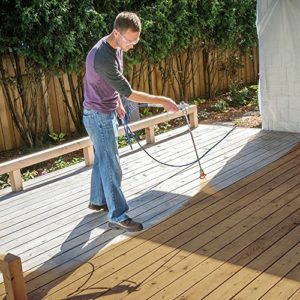 Yes, use a deck stain brush: very wide to cover lots of area at once. You want a quality brush as the bristles fall right out of the ‘budget’ ones. Keep a good brush clean (read how) and comb the bristles straight to dry—it will literally last for generations. Here is a 6-inch brush, but I cannot give it a ‘thumbs-up’ as I have never used it. Can be attached to a broomstick, Hilda. I’ve used similar and the wider 6″ does go a lot faster. Valhalla Lifetime Wood Treatment: B008Y0P8K0 about the same price as above. They seem to make all of the same claims as Eco Wood above. TallEarth has two products: Eco-Safe Wood Guard focusses on insects and wood rot and does not mention color! It seems to darken all woods (from the reviews). This product is often unavailable. But we are not highly recommending it anyway. The other is Eco-Safe, is called a stain-preservative-protectant . 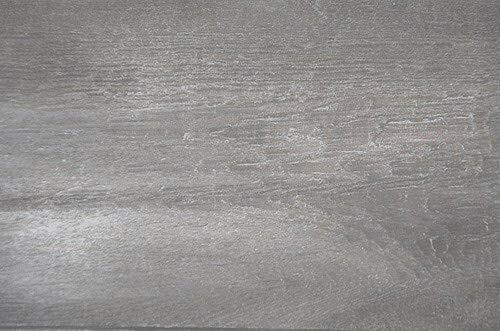 It seems to be more like EcoWood that I used and comes 3 sizes (1-, 3-, and 5- gallon mix packets) and in one silver/brown/aged color. Driftwood Weathering Wood Finish creates a driftwood look, but the packets are much smaller (and cost less). It seems this product is intended more for furniture and other smaller features. This is more of a brush-on or sponge-on stain rather than a spray wood stain. So before you go to DecksDirect and start replacing parts or all of your deck, you can certainly extend your deck’s life this way. 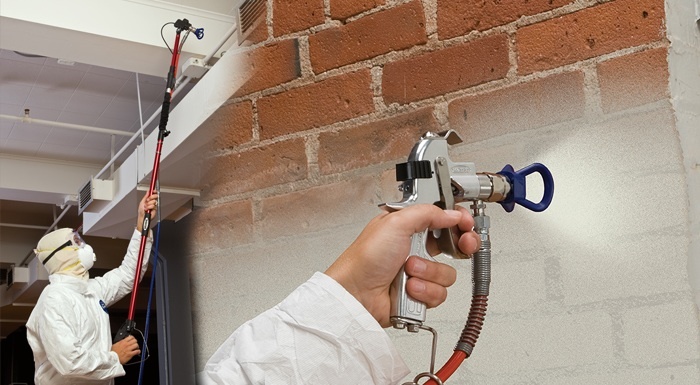 Before starting, be sure to have all the painter tools that you could ever need! Questions about any type of spray wood stain? Use the comments below. Thanks! 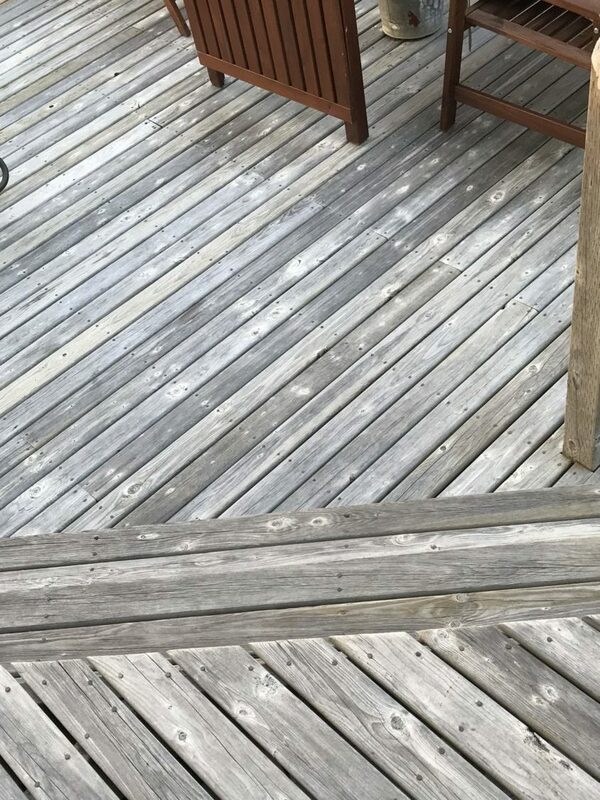 Brad’s deck stain treatment after 1 year.